Recently purchased a sample of this ink from Vanness. Looks like I will be needing more of this Kobe #65 Shinjuku Jet Black. It's a very well behaved dark black ink with a hint of blue. Modest water resistance but I reckon not permanent. A highly useable, yet, interesting black ink for daily use and joy. Won't let you down and provides a bit of sheen plus a hint of blue for a richer experience. 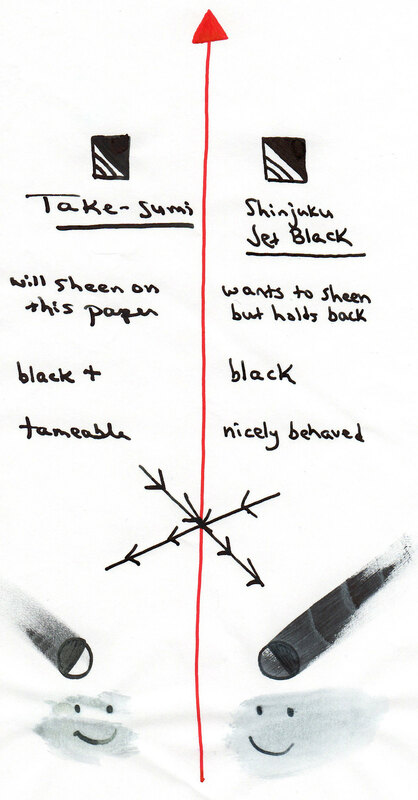 Can see it compared to Pilot Iroshizuku Take-sumi, which is another black ink with something extra. Paper is Tomoe River. The red ink is Taccia Aka that itself is an amazing ink. Thank you so much for your review! I will definitely keep this one in mind next time I need a black ink. Ooo, I like my black inks. This looks lovely in the chroma . . . I've been wondering about this ink for a while. I love good black inks. This looks wonderful. I've found Kobe inks to be excellent. I love Take-Sumi, which also has a nice blue to it. That's a good comparison. Edited by Mongoosey, 24 March 2019 - 02:36. Very nice indeed. I do brush calligraphy and prefer the sumi inks that are blue-leaning blacks--the ones made from pine soot, as opposed to vegetable soot. This ink reminds me visually of those.